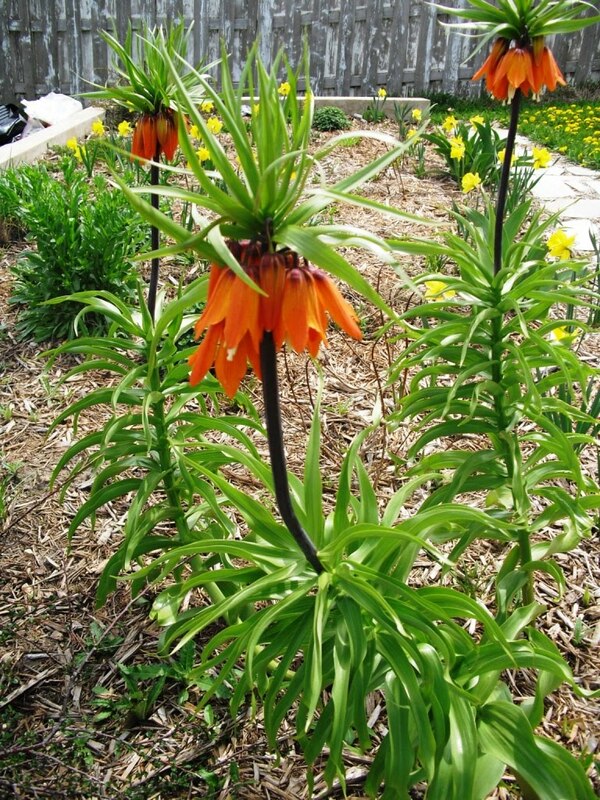 In a post from last year, about a visit to the Chicago Botanic Gardens, I shared a picture of a group of Fritillaria imperialis, also known as Crown Imperials, or Fritillaries. I mentioned in that post that I had never seen them growing in a home garden, but that I would like to try them in mine. This garden is a raised bed, with heavily amended, well-draining soil. It is my understanding that Fritillaria will fail if heavy soil allows water to remain pooled at the top of the bulbs for any length of time. The soil in the rest of my yard is heavy black clay, except for the random pockets of rocky, gritty, builder's fill that I come across when I least expect it. So even though I'd love to have them elsewhere, I decided that the backyard bed would be the best place for them. 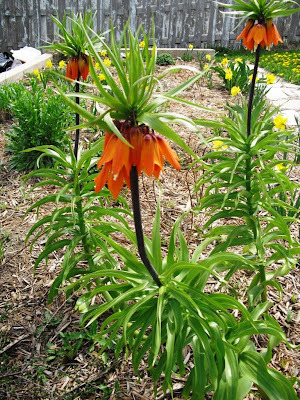 Even so, I'd heard tales of Crown Imperials being difficult to grow, so I wouldn't have been surprised if they hadn't turned up this spring. Shot of a single plant. I was a bit worried that the tall stems might snap in some of the strong winds we've had this season, but the plants took those gales in stride. 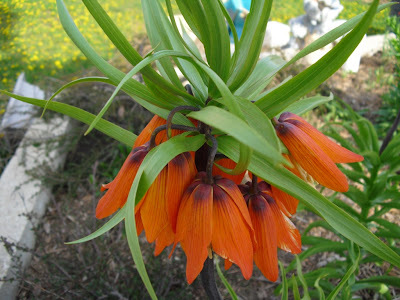 One of the questions that came up about Fritillaria imperialis in the blog comments last spring was about the odor. I knew that the bulbs had a strong scent, sort of like musky garlic. But when admiring the plants at the CBG, I hadn't noticed any smell. Now that I have some, I know better. On cool gray days (and boy, have we had a lot of those here in Chicagoland this spring) you have to stand pretty close to get a hint of that garlicky smell. But if it is warm and sunny, the odor can be quite strong, and travels a fair distance. I find the plants so striking that I don't mind the smell at all. In fact, I was thinking of planting a few more next fall. 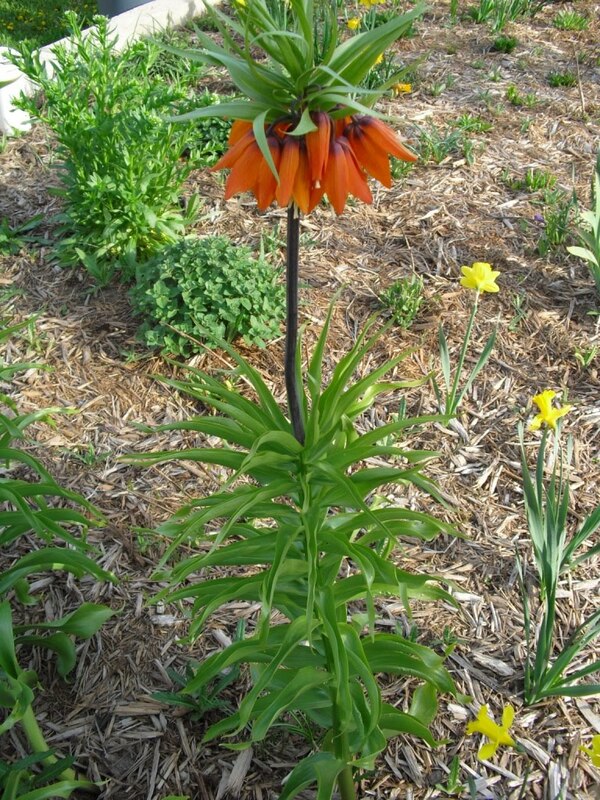 I was considering a getting a couple of the yellow-flowering Fritillaria for a nice contrast, but more of orange would also be nice. Love those orange flowers. And I understand that the bulbs will multiply, so I may get more even if I don't plant additional ones. In case anyone wondered what the inside of those downward-facing flowers looked like. This looks pretty neat if clicked for a larger image. I do understand that a successful first year with a plant doesn't necessarily mean that it is easy to grow. I've had more than my share of beginner's luck in the garden (and with my houseplants.) But since I've also had my share of beginner's failures, including bulbs that fail to come up at all, I'm taking this show of blooms as a positive sign for the future. Orange isn't my color, but those are striking flowers. I just love ORANGE!!! 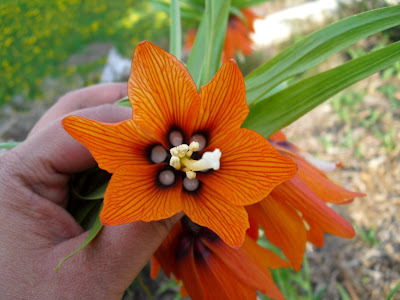 The inside of the flower is so awesome, too! Congrats on a successful grow!!! These are such unique flowers and so striking on the inside too! Well done. I love orange and the insides are so beautiful too!